Whatever makeup you do, you cannot look glamorous unless you have a pair of well shaped and beautiful eyebrows. Eyebrows help you look younger and beautiful. It also makes your face look sexier. You will look dull and worried if your eyebrows are not in good shape. So, eyebrows play a great role in making you look great. The shape of the eyebrow should match the shape of your face. There are usually six different face shapes, which are long, round, oval, heart, diamond and square. You can try 5 different eyebrow shapes to match with your face shape. They are rounded, flat, soft angled and hard angled. First of all, you have to identify your face shape. Diamond: people having diamond face shape have angular features. The face is wider at the temples. The forehead in diamond face is short. Heart: Heart shaped face is very similar to oval shaped face, but here the chin is pointed. It ends in a point. Round: When you have a round face, your face is widest at your cheeks. Long: Long face means that your face has the same width for your cheekbones, forehead and jaw line. Like oval shaped face, long face also has narrow and oval chin. Oval: Oval shaped face means that your forehead is wider than your chin. You have protruding cheekbones and oval shaped narrow chin. Square: Square shaped face is characterized by the same width for cheekbones, forehead and jaw line. One of the striking features of square shaped face is the square jaw line. Here we will see which eyebrow shapes are best for oval faces. Oval shape is an ideal shape for your face. People with oval shaped face are considered lucky because you can try various hair styles and eyebrow shapes and look great in all of them. Some of the celebrities with oval shaped face are Julia Roberts, Kim Kardashian, Katy Perry, Emma Watson and Jessica Alba. When you select eyebrow shapes for oval face, classic high arches and soft angled eyebrow shapes are best options. They look great and suit oval shaped face well. Soft angled shape is defined, but kept rounded. Such eyebrows have angles, but they are not sharp. Instead they have soft curves. The eyebrow peaks are kept soft and subtle. The shape includes low, medium and high arches. You can make this eyebrow shape ultra thin, medium or thick, as you prefer. For the day time you can choose thin and lower arches. If you want to get a dramatic look, then you can go for thick, high soft angled brow shapes. Soft angled brow shapes with small arches are more preferable because they help your brows look more feminine. When the arches are high, your face will look younger. If you have strong cheek bones, then you try thick brows. This complements your face structure well. Try low arches if you have small eyes. Women with big eyes can try high eyebrows, but take care not to angle your brows sharply or highly. Soft angled brow shape makes your brow look soft and delicate. You can create soft angled eyebrow shape very easily. The shape will go straight and then softly curves round at top and down of the eyebrows. You can use a brow pencil with lighter shade to get this look. You may also use a brush. Using the brush helps in making the sharp edges soft and makes your brow look soft as well as natural. This brow shape on your oval face helps in making you look taller. You can also try eyebrow stencils. These are available online and are affordable. Megan Fox, the world famous celebrity, is known to have one of the best eyebrow shapes. She usually prefers to have thick, high arch eyebrows. This helps in making her oval shaped face look sexier. High arches have the ability to open up your face. This eyebrow shape is perfect for beauties with oval shaped face. You can try this shape on thick and full eyebrows also. 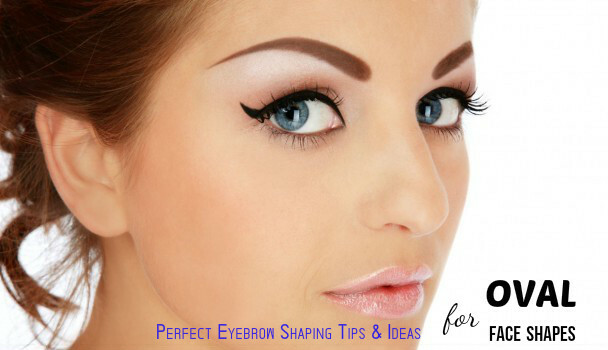 You can use your eyebrow pencil or eyebrow liner to try this shape. The pencil or the liner should be the colour of your eyebrows. This will give your brows a natural look. To create a high arch, you have to find out the natural height of your arch. Then with small strokes, you have to draw a line from bottom inner and the outer brow to the top of the arch. This way you will be able to create a high arch. Now you have to shade your eyebrows with brown eye shadow. Use an angle brush for this. This helps in giving your brows a natural look. Use a concealer and make your shading look clean. After applying the concealer, clean any eye shadow that may have fallen on the top and bottom of your eyebrows, using a flat brush. Whatever eye shape you try, make sure that the eyebrow begins at the bridge of your nose. Hold a paper at the side of the nose to find the exact place. Never try centered arch of eyebrows. It is always recommended to maintain at least two third inches. Take care not to over pluck your eyebrows. You should also not to make your eyebrows too short. Eyebrows should always have a sharp end. This helps in lifting your eyes. You can extend your eyebrows a little longer, bur take care not to extend it lower than where the forehead begins. Some do not understand the importance of eyebrows. But eyebrows are important and define the way you look. So, never ignore your eyebrows. Try to get the best eyebrow shape for your oval face. You can consult an experienced beautician to find it out. How to Get Perfect Rosy Cheeks without Using Makeup?